A trip to the supermarket in Xi’an involves a walk of about a mile in total; today the temperature is around 30º and the humidity—according to my desktop widget—is at 82%. The result of that short walk, coupled with a similar time in the shop, which is cooled somewhat, is that my clothes need to go in the wash. If this is 30% humidity, as was measured in essays 1-15, I dread the very idea of the 90% I would mistake it for. 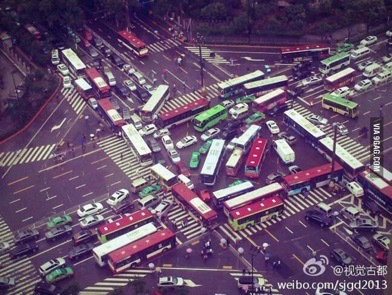 Traffic here in China applies the principle of priorité à droite to the point where even a French driver would cringe. Turning right involves no looking at all, any more than pulling into traffic does: this means that the rightmost lane is pretty clear where there is room to make it so. Cyclists take even less notice, which is pretty daft, since they have more to lose in a collision, even cutting corners to the point where they touch the opposing kerb. In Britain, the white line on a road is treated as if it is a wall. Remember how you felt last time some of the oncoming traffic crossed that line? We drive in the UK as if protected by paint, a fairly funny idea of itself, but conveying the strength of the convention. In China, paint is seen as a vague guideline of direction and therefore largely irrelevant. A taxi is as likely to have the line between its wheels as its wheels between the lines, and as everywhere else, taxi behaviour only represents a slight exaggeration of the general habit. Large roads, I called them boulevards before (in #14), have what is in effect a side road at one or usually both sides. These are used by bicycles, by stopping vehicles (except when someone feels otherwise) such as taxis & buses, by people looking to short cut a junction – and for parking where appropriate. I have failed to identify the local notice indicating that parking is permissible, but roads do or don’t, so I presume there is a sign. The boulevards offer an effective clearway and seem to have a local speed limit of 60kph. Pedestrians enjoy no special privileges here but appear to have even fewer rules to follow than the vehicles. There are many striped crossing points, and generally these are the places where pedestrians will cross the road, more so than in Britain, which could fairly be accused of encouraging jay-walking. There is no expectation of traffic to alter its behaviour, so, if the local lights are not assisting crossing, people will pick a suitable moment to wander across the road, sometimes taking only a lane at a time and always watching for the maverick who denies the existence of paint and lights. Since turning to the right involves no reaction to red lights (I told you they take priorité à droite further), even with the assistance of lights, a pedestrian must take care crossing the rightmost lane. On a boulevard, crossing takes four or more distinct moves, where one just might run the two traffic lanes together, but the two side roads and the two sets of turning traffic tend to push the total to six. A traumatic experience, even with practice, and yet, out running, I find the cyclist I am barely keeping up with will often not even pause at a junction, despite being on what I would regard as the lowest class of transport. I have prided myself for years on negotiating traffic in Britain with apparent ease, but these people put me entirely to shame, demonstrating levels of skill (or disregard) I had only dreamt of – or there are hosts of clues I am totally missing as yet. A week later and I am little wiser: it seems that what is behind you is out of sight and mind – it does not exist. I see people ignoring lights altogether, expecting to turn across moving traffic, walking through dense traffic with no apparent regard at all, overtaking on both sides…. That last deserves more comment: the habit seems to be that a polite blip of the horn indicates that you will be undertaking unless the obstructor chooses to do something. The window for manoeuvre is small because the habit is to do nothing. In Britain, undertaking is frowned upon. I see it most often there on motorways, where some oblivious nit is sitting in the ‘fast’—but really overtaking—lane with space to the inside (left) and faster traffic behind. That faster traffic typically tries different spacings to attract attention and reaction, tries flashing lights, waits a little longer, and then, offended and offending, swoops by on the ‘wrong’ side. The only occasion where such behaviour is acceptable is when in several lanes and at high density, usually going slowly. In this case changing lanes is so difficult, and lane speed so variable (even sporadic) that any of three lanes may temporarily prove swifter. For this to occur even as fast as 40mph is rare, and might happen in tunnels – rare places where it is preferred to keep traffic from changing lanes at all. In China, no such habits exist outside Hong Kong and Macao. For the beginner, the problem is that you don’t know which clues you are missing. An experienced Brit would expect to spot the state of the traffic lights irrespective of the help from the dedicated pedestrian crossing lights and would expect to read the traffic reliably, but would also take into account the changing speed of the approaching traffic. 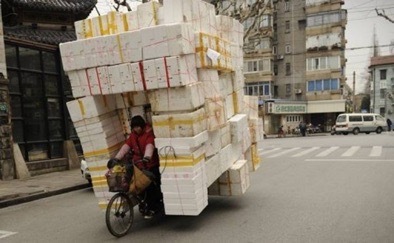 In China, that last can be disregarded, for there is little change of speed. The horn is used to assist others in knowing one is present on the road, but succinctly, politely, helpfully. In India the horn is louder, more insistent, demanding of response and action, and used typically every thirty seconds in an urban environment, In China, it may be used every trip or at every turn; in Britain a typical town driver might use the horn once a week and my own habit would use the horn maybe as much as once in a year. In one car I have owned it was only used annually to check that it worked, in 50,000 miles of use. I wrote about negotiating junctions elsewhere [The Immediate Locale] and apologise for the repetition. Traffic lights in the city control the ‘ahead’ traffic. Large displays on overhead gantries (that are somehow not intrusive at pavement level) show a count down in red or green to the next change. Traffic turning right ignores all lights and applies the apparent right of way to move to the rightmost lane of the right-hand road, rarely doing more than slowing a little. The careful driver slows in advance of the junction (not indicating) and just drifts gently round the corner. Traffic turning left, across the oncoming traffic, even if controlled by lights, behaves in a similar way to turning right, but takes the curve early. In open traffic without special handling for left-turning vehicles, the turner simply heads across the oncoming traffic and space becomes available, apparently by magic. Stopping is a crime. Not literally, but so much effort goes into barely changing speed that it seems so. At busy times, turning traffic can form queues across junctions, a matching pair of slow curves across the road. Traffic density is not as high as in London, but the density of people is higher, the car ownership is lower, the taxi presence hugely greater at about a third of all traffic and the proportion of cyclists (here, in this little bit of one city, Xi’an) matches Oxbridge comfortably. The roads are wider, thanks to the boulevard effect and much of the roadways here are very new. I must be misunderstanding what I am told, but apparently all the roads within half a mile radius of where I live were built this year. In which case I would suggest that there is not enough road built for the future traffic unless some more draconian rules are introduced. Reviewing this at the end of September 2008, I have now seen many cities in China [besides living in Xi’an and Nanjing, I’ve visited Jinan, Beijing, Shenzhen, Shanghai, Suzhou, Hangzhou, Guangzhou and Zhaoqing]. Nanjing and Shanghai are the most ordered of these, with a general disapproval of ignoring lights, but even here the daily bad traffic behaviour in London or Rome is as nothing at all. Recently in Nanjing the city has been entered in a competition for modern cities to demonstrate safety or civic behaviour or some such and we have had the whistle-blowers out in force. Whistle blowers are on foot and stand at a kerb crossing wearing a day-glow jacket and carrying a little red flag – and with a whistle clamped to their teeth. Any excuse causes blowing and the shrill tones replace and displace all manner of speech. At a junction just outside school I counted ten at work on each junction this week. No, really, ten per junction. In rush-hour in Xi’an there would often be the same numbers; that’s two facing each other per road, plus a policeman in the centre of the crossing and his relief wandering the junction (literally), often with his notebook in use. Having coffee this week in Nanjing I saw the regular and only slightly portly officer sat on the pavement, back against a gantry post, legs splayed to his front, head on his chest and fast asleep, where only ten minutes earlier he has been on duty in the centre of the crossroads. Oh for the camera (It never occurred to me to use the mobile). Nanjing has bigger roads and heavier traffic than Xi’an and more supervision. There are significantly more bikes and E-bikes. 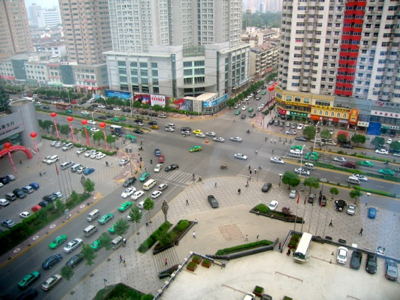 Such comment is highly dependent on where one traffics oneself and I would characterise central Xi’an as crowded inside the city wall, describe Gaoxin (10km from the city centre) as a spacious busy suburb, while painting our bit of Nanjing (less than 2km from the city centre) as more dense than Gaoxin and call the city centre marginally more spacious. Nanjing has more high-rise stuff in its centre. Reviewing this again in late 2010 I see ZhaoQing as the wild west by comparison with Nanjing. Macao and Hong Kong drive on the left and with European decorum and habits. ZQ is filled with awful drivers. I am in the habit of declaring “In China we drive on the left” at junctions, where I see exactly that happen. ZQ has several junctions with no lights or lines, such as at the two significant tee-junctions closest to where I/we live. Traffic turning right and driving on the right takes no notice and, as in Xi’an, people take care not to be seen to look - here I really don’t think they look at all. Traffic turning left will habitually leave no more room than a bike might need to turn right in the opposite direction as they clip the ‘wrong’ kerb. A taxi driver will (always) look for a space on the inside of any curve. Here, it is not unusual to find drivers looking for space also on the outside of the curve, so what is two-lane traffic in the street becomes four or five lanes on the imaginary curve into another road. ZQ is steadily gaining the fences down the middle of the road that Nanjing acquired, for the very good reason that otherwise traffic will be completely across the road in any one direction, just because there is space on the road. Such space being incredibly temporary, but no driver acts as if they recognise any sort of movement is taking place. Parking is generally on the pavement, which destroys that surface. Access to the pavement will be grabbed at the same places which in Britain are absolute no-nos for stopping - such as the crown of the bend. 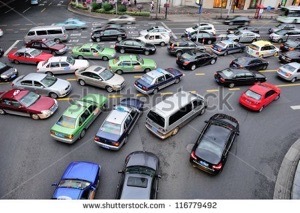 The terrible habit of not looking on pulling into traffic means that anyone foolish enough to drive on the right is continually slowing to avoid someone pushing into the traffic with zero regard for any other road user. By comparison to others, bus drivers and taxi drivers are saintly in coping with these habits. Accidents are frequent and casual. Every accident will collect an instant crowd but there’s no Italian shouting, nor north European resignation. the accidents in Xi’an and Nanjing would involve sitting in the road until the police came to take insurance details and photograph the scene (in Xi’an, literally sitting in the road, on the tarmac). In ZQ, I see fewer officials and more damage - probably because the driving really is worse. Next year will be in Guangzhou, so you will soon know whether the ZQ attitude is southern or small town. These are not my photos, but they are fairly typical sights. 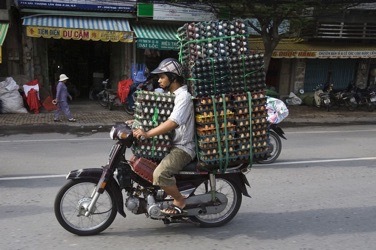 A similar egg load went past me every morning in Nanjing. The polystyrene example is more ordered than most, but not otherwise exceptional.